Don’t miss 2-Time Grammy recipient Chad Carlson on The Producer’s Chair on Thursday, May 26 at Douglas Corner at 6 p.m.
Talking to Chad Carlson at his poolside Cabana home studio about his producing and engineering discography, his never-ending passion for female voices is reflected in his body of work. Carlson’s credits include four albums with Taylor Swift and two with Trisha Yearwood, as well as work with Alison Krauss, Brandy Clark, Sugarland, Jewel, Lady Antebellum/Stevie Nicks, Janis Ian, Thompson Square, Jana Kramer, Maddie & Tae, Matraca Berg, Rachel Proctor, Mickey Guyton, Katie Armiger and Point Of Grace, as well as male artists like Chase Rice, Love & Theft, Blues Traveler, Randy Houser, and Cole Swindell. The list gives you an idea of how busy Carlson has been since he arrived in Nashville in 2002. Carlson hails from Orlando, Florida, where his mother was a choir director, and his (deacon) father played trombone. Carlson mastered the French horn in high school, which led to a scholarship at Southern Adventist University in Collegedale, Tennessee, and a seat in the Chattanooga Symphony. He played guitar in rock bands on the side before attending and graduating from the Conservatory of Recording Arts & Sciences in Phoenix. Admittedly, Carlson didn’t have his sights set on Nashville and certainly not on country music. His influences musically were artists like Prince, The Police and Madonna, so L.A. and New York seemed like the logical place to be. But country music had evolved and Chad’s wife Amanda wanted to be near her parents in Chattanooga, so he agreed that if she could land the interior design job she wanted, he’d give Nashville a shot. His first intern job at Sound Stage Studios, after graduating from the conservatory in Phoenix, led to becoming Garth Fundis’ chief engineer at Sound Emporium. To this day, Carlson proudly calls Fundis a mentor. But every bird must leave the nest and as Carlson’s engineering and production skills became more in-demand, he opened his own Hippo Sound Studio, where his prosperity and his propensity for producing truly emerged over the next six to seven years before finally moving into his new Cabana Studio facility. 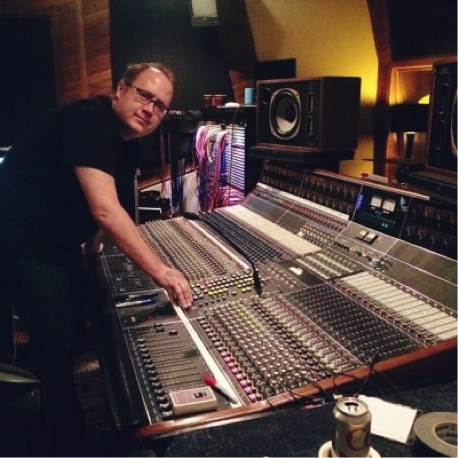 Being a double Grammy-winning engineer (for Swift’s Fearless) has also given Carlson the opportunity to work with some of the best producers in the business including Nathan Chapman, Russ Titelman, Norbert Putnam, Josh Leo, Stan Lynch, Mickey Jack Cones, Derek George, Dann Huff, Fred Mollin, Ross Copperman, Julian King, Sam Ellis, Chris Lindsey, T Bone Burnett, and Victoria Shaw. Carlson signed his current co-publishing deal with Shaw and well-respected publisher Leslie DiPiero/Tom Leis Publishing, in 2012. Carlson has written songs for David Cook, The Scott Brothers (from TV’s Property Brothers), and Jana Kramer. Being an engineer, a symphony-level musician, and a songwriter — and having a background in arranging and composition with one’s own studio and two Grammys already in hand — has postured Carlson perfectly for today’s new breed of artists and tight-budgeted projects. The Producer’s Chair: Through the course of four albums, you’ve watched Taylor Swift develop and mature. What was the most outstanding thing you noticed about Taylor? Carlson: Her professionalism was better than almost anybody I’ve ever worked with. She was dedicated. She wanted to get it right. She was appreciative. As a 14-year-old, she knew how to look you in the eye and be thankful, and be present and she was smart about the music. There’s a lot of artists that come in, sing their part, and let the producer tell you what they want to do and she wasn’t like that. She was really involved from the get-go. She’s a smart girl. We were all young. I think part of the magic from the first record was, it was raw. It was honest, it wasn’t perfect. It wasn’t anything like Fearless. You could see kind of a graduation, for all of us, in every record. Every record became a little smarter or a little more well-thought-out. Her songwriting grew, and she quickly became a world class artist! How did it feel to receive a Grammy? We were in shock I think. And so proud for Taylor. She deserved it and I felt so lucky to be part of it all. It was so awkward walking up on stage though. I thought I was going to get gang-tackled — it was the Album of the Year so, it was the final Grammy of the night. I don’t know if you ever been to the Staples Center. We were way back in the engineer/producer section and Taylor is right up in the second row. So we’re all running and she’s already talking and we just sort of walked in behind her and started giving hugs, but yeah, it was one of the best moments of my life. Knowing what’s out there, would you prefer to produce a male artist, a female artist or a group, at this point in time? The struggle for me is my passion is always been female artists. I love Madonna. I love Fiona Apple and really great female artists. When I got here, I was so spoiled because one of the first things I worked on was Trisha Yearwood and she’s truly probably the best female singer I’ve ever heard. Me coming from a background of not country music, I think females at that time were getting away with really intellectual songs and singing about things that I could identify with. When you are producing an artist, how involved do you get in the song selection process? I try to be involved because it’s really important. It all depends if it’s an independent artist or a label demanding them to do certain songs. A lot of times, I’ll find them songs. I have lots of publisher friends now, and if I write them an email, I hope that they’ll assume that it’s quality enough for them to pitch me good songs. As you produce more, are your engineering gigs diminishing? I don’t want to be known as “Chad Carlson, only the producer,” because you know what? I love engineering. My successes over the past 13-14 years are in engineering and it will always be because I get to work with so many artists. Engineering nowadays is so close to producing. What’s the best advice you can give new producers? I think a lot of producing is learning how not to do things. I have seen a couple different producers that ruin their artist by not knowing how to lift them up and really make them second guess themselves as singers. It’s hard. I’ve also had some young producers that will get in the room, they’ll play the work tape for the band, and they’ll say, “Listen, guitar player, don’t do this. I’m thinking you should play this. Bass player, I want you to stay on the one. Drummer, four on the floor, don’t mess it up.” And they’ll ruin a track because they don’t let the band be themselves. The best producers let the players try whatever they want and then bring them in and say, “OK, let’s go to halftime on the bridge, let’s not try this time thing here—let’s do this.” It’s like when I have a singer in my vocal booth. When they’ll sing, I’ll make a mark, like 10 things they do wrong in their verse. I’m sure as heck not going to tell them those 10 things they did wrong because all they’re going to do is think about those 10 things. I have to find a way to distract them to not do those things. How difficult is it to keep up with the constant technological advances? I think it all has to do with the digital audio work stations. If you know Pro Tools, it’s not that hard, but I have to constantly buy new software. You have to keep up. There’s so much more track-based music nowadays. Listen to Sam Hunt’s record. The records were mostly made in Pro Tools in a room like this. It’s a whole new kind of sub-genre of country music, which I love, but you definitely have to be aware of the technology. It’s not like it was when I started with Garth [Fundis]. We had a tape machine and radar. Luckily I came to town already knowing Pro Tools and I was already building tracks. You have to stay aware. Do you have an A-team of musicians that you primarily call? A lot of producers have a set of players and that’s their guys. I don’t do that. I want to be transparent. I want the right group of players for the project. I am so lucky because I have been engineering for so long and I’ve worked with pretty much all the players in Nashville. So I can tell you, if you need drums that are swampy, who to get — or if you want something with drums with a bunch of technology like loops and stuff, who the right guy is. Or something that’s really appropriate [if somebody wants] “a Miranda kind of thing.” That’s one of the benefits of being an engineer/producer. You learn who is really right because you see producers hire somebody and they may not be right. You learn from their mistakes. What’s on the horizon for Chad Carlson? I have three artists right now. The most ready to blow up in my opinion is a guy named Carter Winter. He’s booked by APA with Jim Butler and he has 50 shows this summer. Mark Bright produced five songs for him and I just produced five more. He has a really deep, amazing voice, but it’s kind of a more aggressive music that’s a little more technology-based. He’s killing it on the road so Carter’s doing great. I’m working with Cody Belew, who was on The Voice a few years back. He’s an amazing singer. We just finished up his project. We did a record and he’s getting ready to start touring. And I’m finishing up a record right now with an artist named Kimberly Dunn. She’s a Texas artist. She’s killing it out there. She’s a functional touring artist. She’s a firecracker, man. We’re just finishing up an 11-song record. Next I’m super excited about a Don Williams tribute record I’m doing with Garth Fundis right now coming out on Slate Creek Records. We are doing an album full of big artists. We’re still waiting on lawyers and signatures, but I can tell you it’s pretty much all of my favorite artists in Nashville.